So, what is this game about? Well it's a turn based exploration game with some RPG elements where you lead a party of pioneers each with different professions, skills and attributes. You start out in a town where you first have to assemble your party from the tavern, plan out and buy equipment you need from the supply store and get yourself a ship. Or two. Then by conversing with different people you get quests, which may be to follow the steps of the previous explorers that never came back and find out what happened, find treasures, compose an accurate map, find contact with unknown native tribes and 'export' religion or simply be the first to disover a piece of the world. 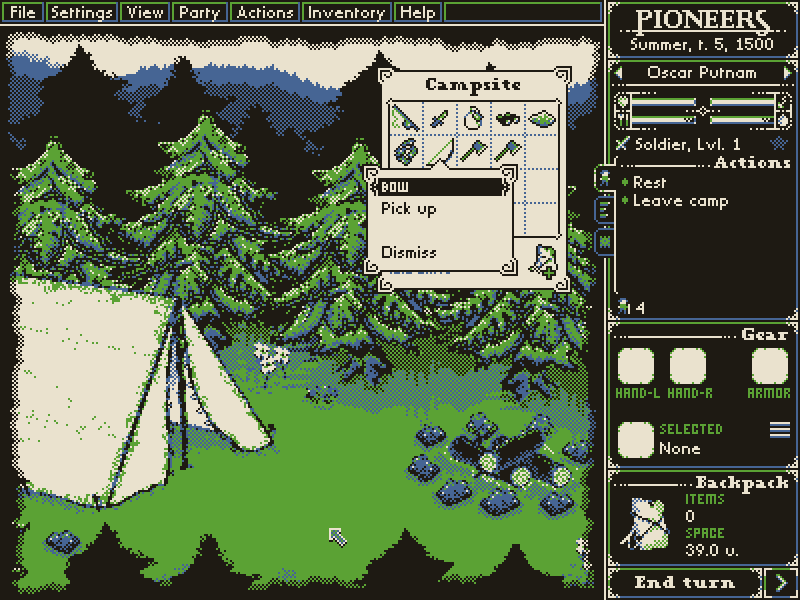 You do all that while surviving the harsh environments with seasons that change each bringing with them a different set of challenges, fighting wildlife and tribespeople, finding food and water and trying not to die of dysentery. With each part of the world you discover, you gain access to larger regions further away from home. It's not that you couldn't go there to begin with but you need more men and supplies, which means you need to collect more wealth beforehand. What else can you do? One crucial, sort of, aspect of the game will be communication. You see, when you encounter an unknown tribe you are not able to understand them because they speak an unknown language. All foreign communication in the game takes place in form of icons/symbols/glyphs that you have to decipher. To make the players life easier, animals and tribes both share the same system. When you see a wolf start to attack you and this certain icon appears over its head you better remember this, because when you interact with some tribes and the same icon appears, you know you better get out of there. If you have any questions, suggesstion or bugs to report please post them in the official game forum linked below. Do download the latest build directly and to get more info about the development please visit the official website. I'm very happy to announce that a new build is now available. It fixes several issues found in the last version but also introduces a lot of new content and gameplay features. For example along with a simple introduction to the story there is now a basic tutorial mode introducing the core gameplay mechanics. What else has been added? In more technical aspects terrain now has height, which has its advantages and disadvantages. Higher ground offers greater range of visibility but isn't always the easiest to reach and ofen blocks your way. Quest system has also been rewritten in Lua, eventually allowing you to make your own quests. In graphics and audio department the campsite and brig now have their own screens. Two new headbobbing tunes have also found their way into the game. That is nearly 30 minutes of original soundtrack now! Please try it out and let me know what you think. Your feedback will help shape this game. If you like what you see and hear, visit the game's website to see how you can show your support. Arquivo .rar contendo os arquivos de tradução do jogo Pioneers para o português brasileiro. 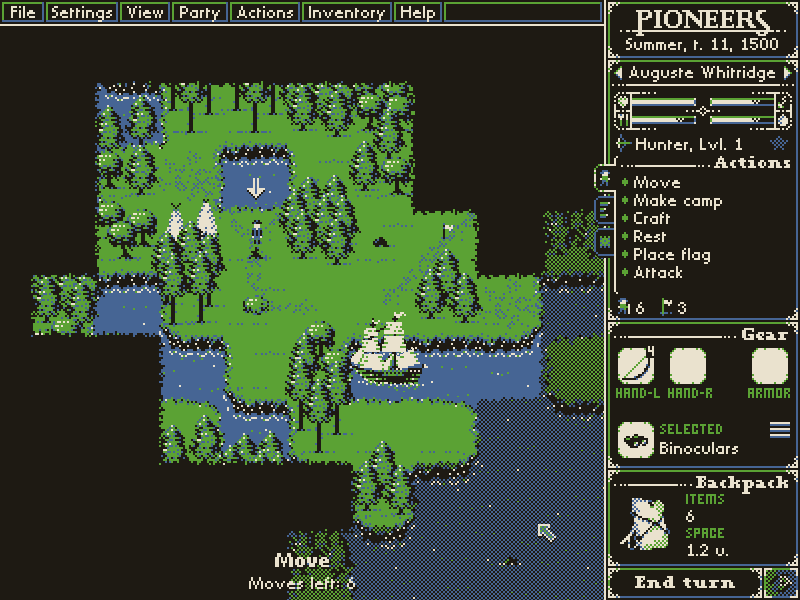 This version adds an overworld and some simple sailing mechanics among other things. 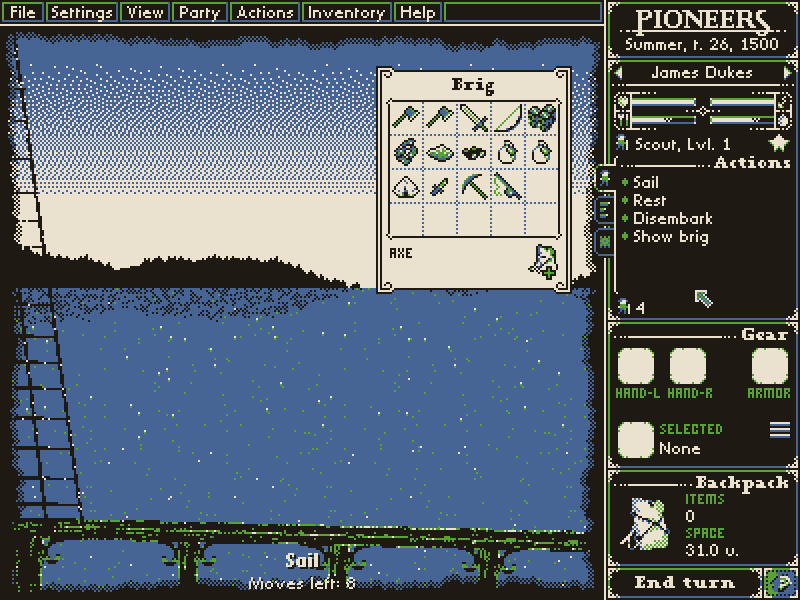 This version adds an overworld and some simple sailing mechanics. Oh, yes, it still is even though slowly. I just haven't gotten around to updating this page here (haven't posted the latest build that's long available on the main website). + Good settings/options for an early build. I like that it defaults to non-fullscreen, and that the music can be turned off (I prefer gaming without music). + The game runs cool (doesn't overwork the graphics card). + Good sound effects, including weather. + The tutorial and helpful hints that popup here and there are indeed helpful. + The sailing controls work reasonably well and are easy to understand. + Even though it is an early build its fun to play. + I like how the adventurer's memory of the terrain fades over time, and that there are place-able flags & a cartographer skill to help deal with that challenge. And that each adventurer has a separate memory of the terrain. And the footprints/tracks on the ground is a nice touch. + Looking forward to when other features are implemented like Crafting, Cooking, Fishing, and communicating/trading with the tribes. Since the combat is turn-based, I'd like to see each of the adventurers be able to perform an action before the adversary (bear/wolf) takes another turn. There were a few little bugs/glitches when dealing with items, but nothing major. Keep at it. It's looking good so far. Wow, this looks fantastic! Tried the alpha really quick at work, it was hard to tear myself away! I can't wait to dive in when I get home. Haha, well, some of the time was spent wrestling with the UI a bit :P Actually, I do UI work in my job, so shoot me an email at jeremyabel@gmail.com if you'd like some more in-depth feedback! Other than that though, it was great! Visuals are outstanding, music is fantastic and really got me into the exploring mood! Don't Worry seems to be working now! :D sorry for the hassle! What do you call the prime of a spy's career? Informative years.